Made in the UK from wool shoddy it's a totally natural, safe and organic way of getting rid of slugs and snails without killing them! We all know that chemical based slug pellets can kill the offending articles but they have also been known to harm other species in the garden such as frogs, birds and hedgehogs. 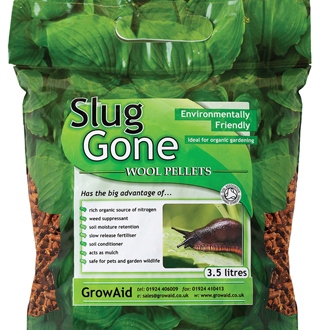 Slug Gone wool slug pellets are composed of 100% natural materials including phosphorous, nitrogen and potassium. As soon as water is added the fibres swell to form a barrier or insulation blanket. When slugs climb onto the fibres it irritates the foot and causes it to seek easier feeding elsewhere. Ideal as a water retainer and soil improver. Slug Gone is a natural mulch and soil conditioner it protects and enriches beds, container pots and hanging baskets. A 3.5 litre pack protects approx. 20/25 plants.